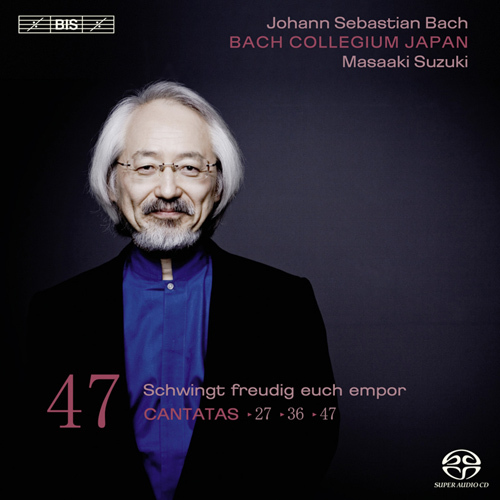 The Bach Collegium Japan was founded by Masaaki Suzuki 20 years ago, in 1990, and the team's cycle of Bach's Cantatas was launched five years later, in November 1995. Now, 46 volumes and fifteen years later, the series has entered the final stretch but is still going as strong as ever. Reviews of recent volumes speak for themselves - 'With Suzuki you can hear Bach's heart beat...' the reviewer in International Record Review wrote in regards to Volume 40, while Volume 43 caused the critic in Fanfare to rhapsodize: 'a set for the ages, not only performed with consummate style, historical considerations, and musical substance, but with a feeling for these seminal religious works that transcends the merely mechanical presentation that we so often - too often - hear.' There is certainly nothing mechanical about the present performances, of three works which in emotional content range from the joyful vitality of the Advent cantata BWV36 to the meditations upon death and the leave-taking of this world which permeate BWV27. As always the opening choruses are of particular interest, for instance that of Cantata BWV47, a striking example of Bach's skills in illustrating a text in music but also a highly complex composition in which the interplay between choir and orchestra is beautifully balanced. The soloists also have their share of fine moments on this instalment. Hana Blazíková, dubbed 'an ideal Bach soprano' in International Record Review on account of her performance on the previous Cantata volume, performs the charming and playful aria 'Auch mit gedämpften, schwachen Stimmen' with solo violin, while Robin Blaze and Peter Kooij - both veterans of this series - each have received a true display piece in the form of the two arias of BWV27. 20 Wer weiss, wie nahe mir mein Ende!, BWV 27: Aria: Wilkommen!